Not too many months ago my Partner & I saw Pat Martino in ‘Birdland‘ and were captivated by his deep-in-the-groove East Philly style. There could hardly have been a better place to hear him, as this is one of New York’s best Jazz clubs and a friendly intimate space. Like most out-of-towners we loitered awhile in Times Square before walking the short block to ‘Birdland’. I could hardly believe my luck at being able to see Pat in such a setting as I had become a fan some years earlier; having developed a taste for that whole Grant Green thing. The first of the band members to step on stage was Tony Monaco the B3 player, quickly followed by the drummer Harvey Mason. Soon Pat appeared with his shining custom-made black Benedetto guitar at the ready – a slightly built man who quickly lost himself deep within the music. The band leapt into their first few numbers with an apparent relish. Obviously enjoying what they do and perhaps that is the hallmark of this Chicago – East Philly guitar -organ-drum style. Seeming to drop deeper and deeper into the groove and then characteristically locking into a phrase until the intensity becomes almost unbearable – then as suddenly dropping back into the melody again. When Pat plays alongside Joey Defrancesco and Byron (Wookie) Landham the band is a force nine hurricane. No drummer works as hard as ‘Wookie” with his powerhouse locked-in beat and no B3 player owns as much of the room as Joey D. It was however just as interesting to hear Pat with this band and they proved to be solid performers. Tony is great on the B3 and his tendency to grimace and mug as he reaches ever deeper into the groove did not unduly trouble me. The drummer Harvey did what good groove-drummers do and locked into Pats sound. After the faster offerings it was a pleasure to hear Pats well-loved version of ‘Blue in Green‘(Davis/Evans) and the warmth and perhaps the hint of sadness in his sound brought a tear to the eye. The sound Pat gets from his specially wound strings is fat and warm and it hits you right where it should; in the heart. I have just learned that Pat is about to play at ‘Yoshi’s‘ (Oakland) and I have urged my son and daughter-in-law to go if they can. Pat may have an amazing and unique life story, but it is the warm looping bluesy sound that gets you in the end. I can probably cope with warm bluesy looping. I hope someone is offering to pay you for these gems. I’ll be interested to see if you ever give a bad review! For a suitable fee I could ‘gore and toss’ a few people – to paraphrase Dr Johnson. 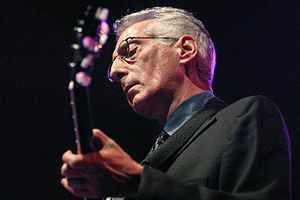 Well well – a piece about pat Martino – how surprising – NOT! – thanks mate for turning me on to the Pat and B3 sound which I now see is “this Chicago – East Philly guitar -organ-drum style”. I’m well into it now (of course via CDs but – Oh how I wish I could have been there to hear it live in an NYC club setting with it’s intimacy and history to enhance the experience.